This timeless romantic comedy finds senior citizens Sam and Amy, newly-married, arriving at their honeymoon retirement village only to discover the “Fountain of Youth” in their new Florida home. No one realizes that the water supply to their new apartment wing is hooked up to this fabled liquid. Amy sips some of the water, and their honeymoon turns topsy-turvy when she becomes a nineteen-year-old! Now they must survive the most incredible and comical “period of adjustment” a bride and groom have ever encountered. Call 352-746-7606 for tickets $19. Nature Coast Exhibit #3 Wine and Cheese Reception Free. 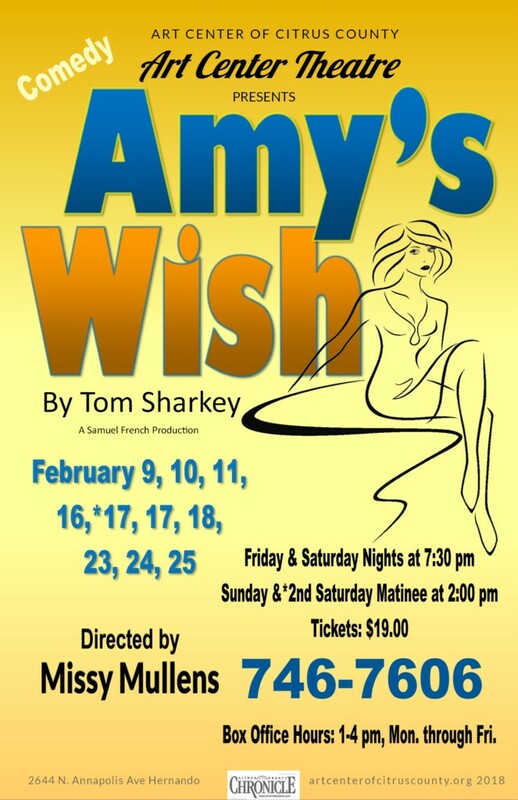 This entry was posted in 2017/2018 Season Plays, Art Center Building, Art Center Theatre, Art Exhibits, Local Art News, News, News, Paintings, Photography, Social Events and tagged Amy's Wish, art, Gallery, Missy Mullens, Nature Coast Exhibit #3, painting, theater on February 1, 2018 by Art Center.